Chase In Dale, Barbour, Pike and Bullock Counties Ends In Apprehension :: RickeyStokesNews.com! DALE COUNTY: Friday at approximately 3:30PM DCSO Deputies conducted a traffic stop on Pea River Rd in Ariton for failing to stop at a stop sign. As deputies were obtaining vehicle information they learned that the vehicle’s license plate was switched. The driver, Lisa Griggs, was acting erratically as deputies were speaking to her during the stop and she was instructed to exit the vehicle. Griggs briefly exited but was able to re-enter the vehicle and fled. One deputy was briefly drug on the side of the vehicle but was able to free himself. Deputies then initiated a pursuit which traveled into Barbour, Pike and Bullock Counties. During the pursuit Griggs rammed the deputy’s vehicle multiple times. Deputies attempted a pursuit intervention technique but were unsuccessful. 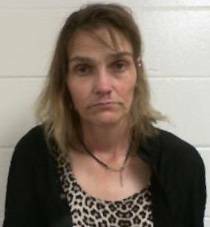 Once the pursuit entered Bullock County on Hwy 29 deputies lost visual but an ALEA Trooper spotted the vehicle a short time later and pursed Griggs down Bullock County Rd 113 where she went down a dead end drive and was taken into custody. Griggs has been charged with Attempted Assault 2nd (on a Law Enforcement Officer), Reckless Endangerment, Attempting to Elude and multiple traffic violations. Additional charges may be forthcoming. We would like to thank the Pike and Bullock County Sheriff’s Office as well as ALEA’s Highway Patrol Division for their assistance.